We regularly try to offer discounts on some of our most popular training courses. The offers below and those provided in our emails are subject to availability and restricted to dates. The best way to find out about our lastest discounts is to sign up to our course discount mailing list. 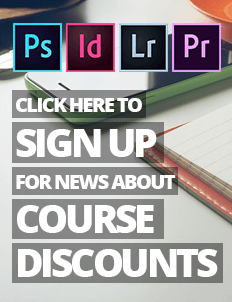 The course discount mailing list is managed by MailChimp, so you are able to unsubscribe at any time by simply clicking the unsubscribe link in any of the emails you receive from us. We endeavour to provide you with relevant information about our course discounts and promise never to provide any of your information to any third-party services. We are registered with the ICO and adhere to the data protection guidelines laid out for their members. If you do have any problems signing up, please do not hesitate to contact us using the contact form and we will be in touch with additional options on how to receive course discounts. 1. See our Graphic Design training packages page - package discounts on Adobe Photoshop, Adobe Illustrator, Adobe Indesign and Adobe Dreamweaver training packages. 2. See our Web Design training packages page - package discounts on Adobe Photoshop, Adobe Dreamweaver, and HTML & CSS web design training packages. 3. See our Web Developer training packages page - package discounts on jQuery, PHP with MySQL, and HTML & CSS web design training packages. 4. See our Business Startup packages page - package discounts on Adobe Photoshop, WordPress, and Google Adwords training packages. It is often a good idea to let staff that work together, learn together. Talking to someone you already know about what you've learnt is a great way of reinforcing your knowledge. Therefore, if you have multiple staff that wish to attend a course, then we can offer you a 10% discount for each additional student booked. A single student would pay £495 for a course of that price, but if 2 students were booked then the first student would pay £495 and the second student would pay £445.50. Every additional student would also only pay £445.50. The same applies to multiple bookings for the same student. The highest priced course is charged at the standard rate, but every additional booking made at the same time has a 10% discount applied. Group sizes of 5 or more can be negotiated for an additional discounted rate. Please contact us for a no obligation quote via the contact page.